So, a little tidbit about me – I have always had amazing vision. I’ve relished in the ability to read a road sign from hundreds of yards away or spot an anomaly on the horizon before others could focus enough to see clearly. It was so great! When I turned 40, after spending years staring at a computer screen, I thought it best to go to the eye doctor….just to ‘check.’ Hmpf. Well, that little checkup had me walking out in bifocals. BIFOCALS! My vision and my ego were shot. Meh, I’ve gotten used to wearing glasses over the years and have transitioned to trifocals now (one for reading, one for crocheting, one for seeing your lovely face across the room). This change has wrought a whole new set of problems when waking in the middle of the night – I need my glasses just to walk across the room and finding them in the dark has been no small feat. Enter, the hanging basket for the bedpost. I designed this basket to keep my glasses (and phone for those late night, menopause induced bouts of sleeplessness when I simply MUST play one more round of Toy Blast) within easy reach. The basket simply slips over the bedpost to keep all my essentials handy. I’ve since made others to hang on the stairwell to gather little things that need to be brought upstairs and one for the coat rack for keys and sunglasses. They’re the perfect size for all those little bits and pieces that would go missing otherwise. I thought it’d be a great idea to offer the pattern to you, now, in case you’d like to create one as a grown-up Easter basket or Easter hostess gift. The basket whips up very quickly, in less than an hour so it makes a fast and easy project for anytime! Want an ad-free version of this pattern? It comes with a photo tutorial of the Cross Stitch for your convenience! You can purchase it for less than the price of a cup of coffee on Ravelry! Important Note : To make the Cross Stitch: Skip the first stitch, SLST in to the next st. and CH2. HDC in the skipped stitch. Cross stitch made. To continue: *Skip a stitch, HDC in the next stitch, HDC in the skipped stitch. * Continue this pattern to make a round of cross stitches. With the right side facing you, secure your yarn with a SLST in the lower center part of the hole. CH1 and work a RSC in each stitch around the hole. I ended up with 24 sts. Join with SLST to beginning ch1. I hope you love this basket and enjoy making it for all your friends! 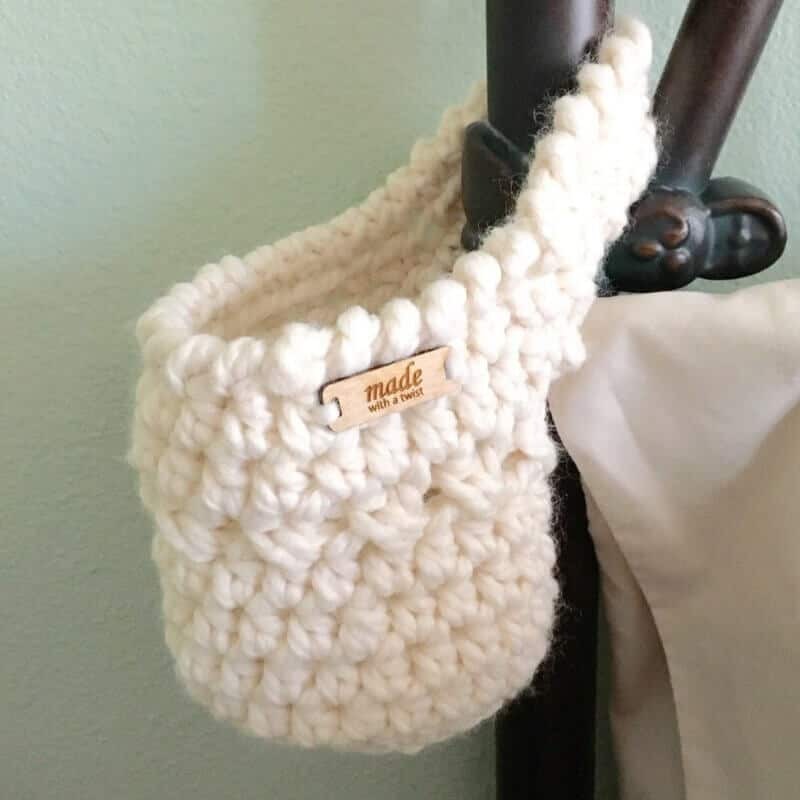 Click HERE to purchase a completed basket from Made with a Twist by Crochetpreneur! This is a GREAT idea!!! Thank you so much for the pattern!!!! You’re so welcome, Ericka! I hope you’ve enjoyed making one to two…or more! I just found your site through Pinterest & I’m so happy to hear that I’m not the only one playing Toy Blast in the middle of the night when suffering from menopause-induced insomnia! Can’t wait to try your basket pattern. Thanks! Hi Suzanne! I hope you like the pattern. Welcome! Hello! I requested the pattern several times today, and from several different computers- such a cute project! I never did get the email, and it hasn’t gone to any of my email folders…could you email it, please? Oh gosh, Jennifer! I show that I’ve sent you 7 emails today through my automated system. They must be going to your junk folder. If you could at pam@crochetpreneur.com to your contact list, that would resolve the issue and you’ll be sure to receive info all my free patterns in the future. Go check your spam/junk/trash folders and let me know if you still aren’t able to receive them, K? I did add you to my contacts, hope that helps, and will try again. Strange…nothing. I just used my work email address and that seemed to take care of the problem. Curious! Thank you!